Adrian Simila is a prophetic missionary evangelist with gifts of healing and miracles. He has done mass crusades across Europe, Africa, and India. He is currently the Director of World Harvest Missions and The Lord's Ranch in Newport, WA. Adrian was saved during the Jesus Movement of the sixties. He attended Portland Bible College and received a minister's license. 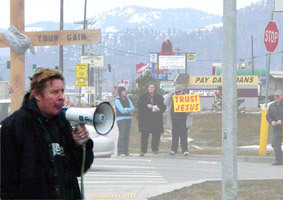 He worked with Jim Durkin and Gospel Outreach out of Eureka, CA. He spent the next eight years traveling as part of their apostolic church planting team; starting two churches in the Northwest. In 1980, he joined Bill Lowry and Christ is the Answer tent ministry traveling across America doing revivals. In 1986, Adrian received a call from the Lord to do missionary work in the communist countries of Eastern Europe. He started a Bible University in former Czechoslovakia training students from Europe and the US in evangelism and church planting. He returned to the US in 1995 to work in tent ministry and evangelism in Columbia, SC. In 1999, he moved to Spokane, WA to start a street ministry and discipleship home, which is currently known as The Lord's Ranch, a thriving Christian community. Adrian lives here with his wife, Janis and two children, Benjamin and Erica. They recently opened a women's discipleship home nearby. World Harvest Missions has an emphasis on reaching out to the counter-culture, homeless, and lost worldwide.